Getting your daily dose of probiotics through food doesn’t get any easier than this guacamole recipe…welllll, unless of course you’re just eating the sauerkraut out of the jar. You might be blown away by this recipe concept here, or you’ll be like me and say “why didn’t I think of this sooner?”. I always felt bad dumping a jar of sauerkraut juice or brine after I finished the nourishing veggies. Ever since I read the back of the bag of sauerkraut by Farmhouse Culture a year ago, I realized I need to put that sauerkraut brine to use! If you think about it, that brine is really just salt water with a tart/sour taste– thanks to the healthy probiotic bacteria that occur during the fermentation process used to make the kraut. Why would we dump it down the drain when we can use it in other foods and continue to reap the benefits? Ever since realizing this, I have been putting it in everything from guacamole to tuna salads. 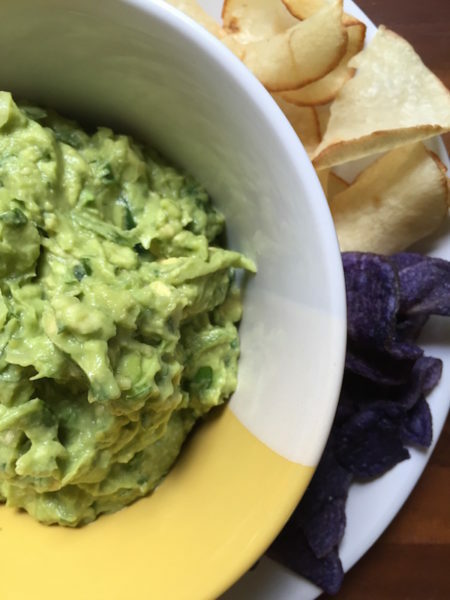 It’s time I share this guacamole recipe with you too! Eat more sauerkraut. The best way to get healthy probiotics in our gut is to eat fermented foods. And remember, over 70% of our immune system relies in the gut. A healthy mix of beneficial bacteria is important for our immunity against diseases of the body and mind. Fermenting foods and beverages is something humans have been doing since before the dawn of history, but we’ve recently watched fermentation disappear in households or communities; thanks to modern food production and dissipating culture in America. The benefits of eating fermented foods are tremendous. They are nearly incalculable because the world of microorganisms is so vast, complex, and miraculous that scientists could be discovering new benefits forever, and ever (and ever). “The Art of Fermentation” by Sandor Katz, is the food fermentation bible. It’s truly an incredible resource for traditional foods fans, and science nerds interested in the complexity of the “microcosmos”. In his book, Katz explains probiotic benefits that have been researched, documented, and quantified in lab testing or human studies. Probiotics are definitively linked to treating and preventing diseased of the digestive tract, like diarrhea, inflammatory bowel disease or syndrome, constipation, and even colon cancer. Probiotics show efficiency in lowering high blood pressure and reducing cholesterol, and anxiety. Researchers are actively exploring the theoretical benefits of probiotics such as in treating allergies, urinary infections, preventing kidney stones, periodontal disease, and various cancers (various references, all cited in “The Art of Fermentation“). There is also talk about the different probiotics for men or women (that target different things). If you would like to know more about what to get as a man then you should check out something like this website here: purepathessentialoils.com/best-probiotics-for-men/. A review in the journal of Clinical Infectious Diseases predicts that probiotics may “prove to be one of our most effective tolls against new and emerging pathogens that continue to defy modern medicine in the 21st century.” Like I said: important for immunity. If you aren’t currently into kraut, let me tell you: this isn’t the kraut you’re thinking of…from a ballpark bratwurst. This is a crunchy, bright and flavorful “salad” made with nature, and time. And most sauerkraut do not have the classic kraut taste we remember from eating german food or bratwurst, because other versions are made without caraway seeds. Take a stroll down to the vegan cooler at your supermarket, and you’re sure to find jars and bags of artisanal sauerkraut in all different flavors and creations! I encourage people to try different brands and flavors because you may like one, and dislike another! See my Sauerkraut FAQ’s in a previous post for ideas about what to do with sauerkraut you purchase, taste, and decide you don’t like. Do probiotics or sauerkraut give you increased digestive issues? Start very small with your doses/exposure, and work your way up. Consider looking further into your symptoms to learn if you might be showing signs of SIBO— a condition where bacteria starts to invade the small intestine (where it doesn’t belong; we want the bacteria in our large intestine). So, now that you’re on board with the sauerkraut action, how’s about we start with a recipe? Make this for your family or friends, and they will have no idea the sauerkraut is in there! Especially if you chop it up. Nearly any flavor of sauerkraut will work in this recipe, but stick with the basics and you’re a-okay. I use several different brands (variety is great because no single fermentation or recipe gives the same results), but usually stock up on the kind made only with cabbage, sea salt, and water. This is so versatile and we eat it with nearly every meal! It’s a great way to start your day, and you only need about 2 tablespoons of kraut to get billions of probiotics. Once you get accustomed to the flavor profile, you’ll crave it and love it. It’s our body telling us “Yes! You’re doing the right thing!”. 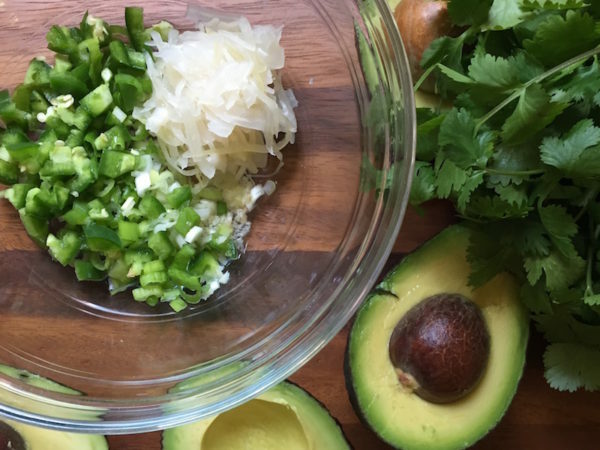 Using fresh garlic and scallions gives the guac so much dimension, but it’s best to take the edge off first by soaking the garlic and onion in the sauerkraut brine. Serve up your probiotic guac with crunchy bell peppers or the healthiest chips on the planet: Jackson’s Honest purple heirloom potato chips, slow-cooked in coconut oil. Pictured at the beginning of this post is a mixture of Jackson’s Honest purple heirloom, and Artisan Tropics Cassava Strips. See my recent post highlighting paleo snacks for more info. Traditional guacamole made with sauerkraut veggies and brine, bringing you healthy probiotics that no one would detect! 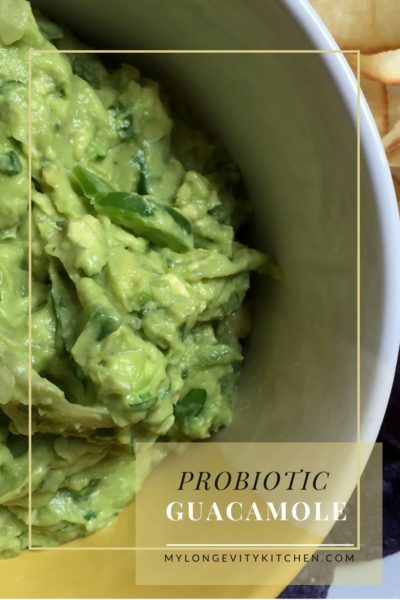 Probiotics and guac were meant to be. In a mixing bowl first add your minced GARLIC. Then top with SCALLIONS/onion. Pour the SAUERKRAUT BRINE over the garlic and scallions. This helps take the edge off. Follow with your SAUERKRAUT VEGGIES and JALAPEÑO (if using). 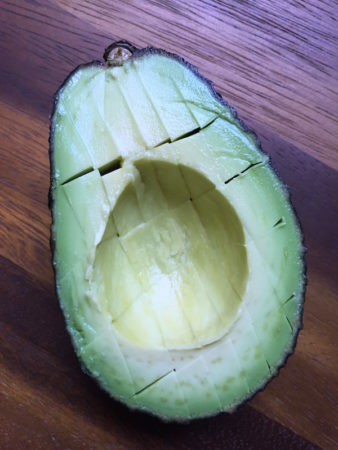 Slice your AVOCADOS in half, remove the pit, and carefully slice a checker board into the avocado (see blog photo) to make smashing easier. 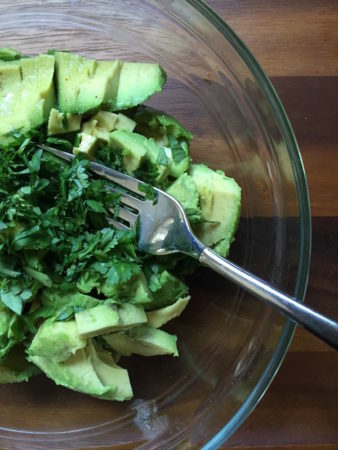 Scoop the avocado out of the skin and into the bowl. Add the CILANTRO and start mixing, from the bottom of the bowl, with a fork. It's best to leave some chunks of avocado. 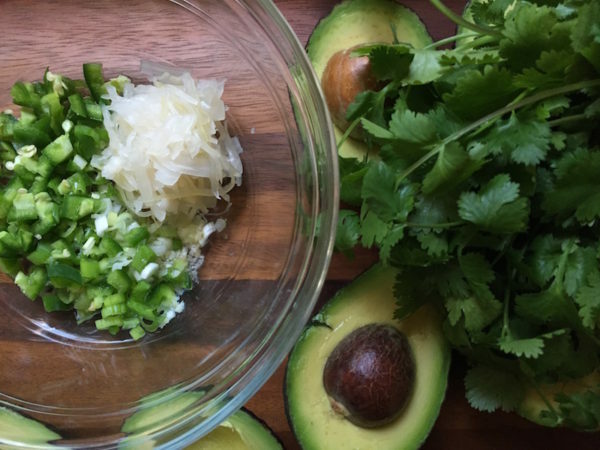 Since all sauerkraut brines are different, you should TASTE your guac and decide if you'd like to add lime or salt. I recommend 1/8 teaspoon of sea salt and 1 teaspoon of lime, if needed. Enjoy right away or see notes for storage tips. Selecting Sauerkraut: Try this recipe with any type of Sauerkraut (ideally without caraway seeds). The brands I like to use are Bubbies, The Brinery (Fair N By), or Farmhouse Culture (Garlic Dill). Find real, probiotic sauerkraut in the refrigerated section only (typically by the vegan foods). Prepping Sauerkraut: Chop your sauerkraut veggies if you'd like to disguise this ingredient...no one will know. We don't chop it up in my house because it's easier and tastes just as great. Storage: To store your guacamole, squeeze lime over the top, or cover the top with a slice of tomato to stop air from making contact with the guac's surface. Follow with a layer of plastic wrap that is pressed down onto the surface of the guac, further preventing air from making contact. I love that you showed bubbies in the article! They are by far my favorite and first choice when it comes to purchasing sauerkraut at the store. But I would love to make my own at home! Regardless, you blew my mind when you mentioned using the left over liquid in tuna salads. 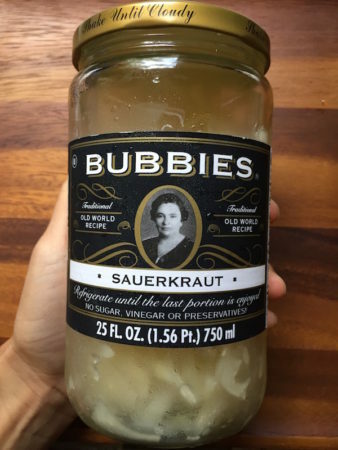 I usually use relish / pickle juice in my tuna salad to give it a tart / vinegar-like bite, but why on earth wouldn’t I just use leftover sauerkraut liquid to give it the same bite? Genius! Thank you for sharing the article. There you go! I’m so happy you enjoyed this recipe idea. Have fun with it. Oh you definitely got me there! I forgot, but I will change it now. Thank you!